Thea Trinidad remembers her father on the anniversary of 9/11, CM Punk speaks about his future in MMA and not appearing at "All In", Honor Club to carry this Friday's CMLL Anniversary card, list of matches for tonight's SmackDown episode, Michael Chiesa files lawsuit against Conor McGregor & Barclays Center. **Today’s edition of Rewind-A-Raw features Wai Ting and I reviewing Raw from New Orleans, the return of Mick Foley and addition to Hell in a Cell, The Shield’s strange manipulation of law enforcement, Ronda Rousey’s tag match, Renee Young being added to the Raw team permanently, the Cody vs. Nick Aldis rematch, Nicco Montano being stripped of the flyweight title, and I review AQUA’s concert from Saturday night in Toronto. You can download the show directly or subscribe to POST Wrestling on iTunes, Stitcher, Spotify, Google Play or wherever you listen to podcasts. **Wai Ting and I will be back tonight with Rewind-A-SmackDown to chat tonight’s show from Lafayette and we will also preview the full Hell in a Cell card and take your questions & feedback. **We will also have our weekly “Double Shot” show coming out Wednesday morning with reviews of the last week’s Lucha Underground episode, the Jay Lethal vs. Jonathan Gresham Ironman match, and last week’s 47-minute episode of “Being the Elite”. This show will be up for all members of the POST Wrestling Café. **WH Park will return on Wednesday for POST PURORESU. The two of us will be chatting this month’s Destruction cards from New Japan, the recent tag match with the Golden Lovers vs. Tomohiro Ishii & Will Ospreay, mixing up the juniors with the heavyweights, the Naomichi Marufuji 20th anniversary card, an update on Stardom’s 5 Star Grand Prix, the Takayamania Empire benefit show for Yoshihiro Takayama, Zeus’ first defense of the Triple Crown, Shingo Takagi going freelance and WH’s picks for best match, show & performer of the past month. **The feedback thread for this week’s Rewind-A-Wai on UFC 194 (Jose Aldo vs. Conor McGregor) is up on the POST Wrestling Forum. **This Sunday night, Wai Ting and I will be doing a live video stream of our review of WWE’s Hell in a Cell for “Double Double”, “Iced Capp”, & “Espresso” members of the POST Wrestling Café. We will be going live immediately after the show wraps up and then the podcast version will up later that night for everyone. **We are also going back to re-watch the Mick Foley vs. The Undertaker Hell in a Cell match and that re-watch with our commentary will be out Friday for “Double Double” and higher members of the POST Wrestling Café. **With today marking 17 years since the tragedy of 9/11 in September 2001, the WWE has posted a short interview that Renee Young conducted with Zelina Vega (Thea Trinidad), whose father died in the World Trade Center that day. Michael Angel Trinidad was only 33 years old and was on the 103rd floor of the tower and called home to say goodbye that morning when Thea was only 10 years old. The two had bonded over pro wrestling because Thea’s father was a huge fan, specifically of The Rock and eventually Thea got to meet Dwayne Johnson and tell him about her late father. **Impact Wrestling has priced the tickets for this week’s tapings in Mexico from $10 – $32 (U.S.) before service fees. **The Undertaker is scheduled to appear on next week’s episode of Raw from Dallas, Texas. **PWG will be holding their biggest shows of the year this weekend in Los Angeles with the annual Battle of Los Angeles tournament. The three-day event begins Friday and runs through Sunday at the Globe Theatre and the is the first time in ten years the tournament has taken place outside of Reseda. The tournament will feature the following opening round matches spread out between Friday and Saturday: Adam Brooks vs. Rey Horus, Puma King vs. Flamita, Brody King vs. PCO, Joey Janela vs. David Starr, T-Hawk vs. Bandido, CIMA vs. Jody Fleisch, Walter vs. Timothy Thatcher, Jeff Cobb vs. Darby Allin, Jonah Rock vs. Sammy Guevara, Trevor Lee vs. Chris Brookes, Robbie Eagles vs. DJ Z, and Shingo Takagi vs. Ilja Dragunov. **Pat Laprade of TVA Sports spoke with Mick Foley about the anniversary of the Hell in a Cell match and Foley’s one-man show that heads to Montreal on Wednesday. **Tickets for the NWA’s 70th Anniversary card go on sale this Friday and will be priced from $19.48 (in honor of the year of the NWA’s formation) up to $70 for ringside seats. The event will feature the rematch between Cody and Nick Aldis for the NWA championship and takes place from the Nashville Fairgrounds on Sunday, October 21st with the show being streamed live on FITE TV. **Paul Heyman turns 53-years old today. Which of the following non-WWE television programs do you follow most consistently? **CM Punk (Phil Brooks) appeared on Ariel Helwani’s MMA Show on ESPN Monday to promote Ultimate Beastmasters, which was released on Netflix last month. 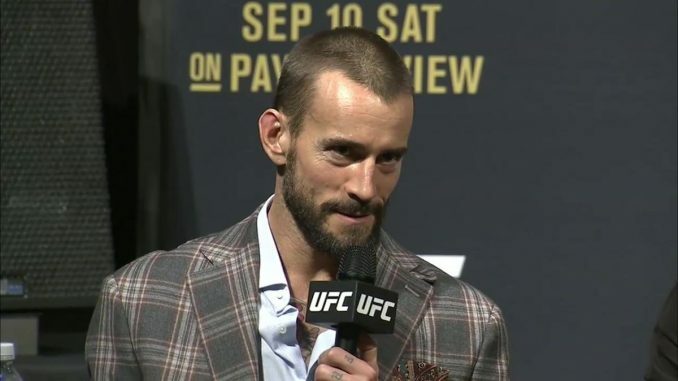 Punk listed off the movie projects he has been working on and was non-committal on a return to mixed martial arts. He stated he would decide by the end of the year and added that it wasn’t “UFC or bust” for him, suggesting he would be open to fighting elsewhere if he wasn’t retained by the promotion. He showed no desire to entertain the idea of professional wrestling, although he was presented with an invitation to “All In”, although it was a vague invite with no specifics discussed and he was shooting his recent film that day regardless. He referred to professional as an “escape hatch” and wasn’t interested in anything with pro wrestling. He was asked about Colby Covington’s character and wasn’t receptive to his tactics, calling the act “racist” and didn’t care for him or the approach. **UFC lightweight Michael Chiesa has filed a lawsuit against Conor McGregor stemming from the bus attack in Brooklyn this past April during UFC 223 fight week. TMZ reported the news with Chiesa filing in the state of New York claiming he suffered severe emotional distress, mental trauma and/or bodily harm and suing McGregor for assault, battery and intentional infliction of emotional distress. Chiesa has also listed the Barclays Center in the suit for not providing proper security measures to protect them. The incident occurred after media day where McGregor and company stormed the arena as fighters were getting onto the bus and proceeded to attack with a guardrail and dolly being thrown. The dolly smashed a window of the bus causing Chiesa to be cut on the forehead and was unable to be cleared to fight that Saturday at the event. Chiesa has spoken about the ripple effect that he believed he could have been the one chosen to fight Khabib Nurmagomedov in the main event after Max Holloway was forced to withdraw and Al Iaquinta took the fight one one-days notice. **The UFC 228 preliminary fights on FX from this past Saturday didn’t perform well with an average viewership of 560,000 viewers. It’s a good comparison with last month’s UFC 227 card because the prelims on that show also aired on FS 1 and averaged 717,000 viewers so it was down 22% from last month. The difference can likely be attributed to the college football competition they faced this past weekend on ABC and ESPN. The UFC 228 prelims featured Tatiana Suarez destroying Carla Esparza in the featured prelim bout. The UFC 228 pre-fight show on FX averaged 271,000 viewers at 7 pm.